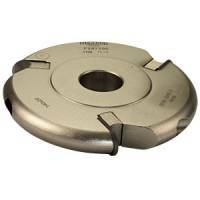 Biscuit jointing can be carried out with the router using a 4mm groover, an arbor and suitable bearings. The biscuit is made from compressed beechwood, which will swell when glued with a water based (PVA) adhesive and thus produce a tight joint. Selecting the correct size bearing will ensure a depth of cut slightly over half the width of the biscuit. The groove should be cut slightly longer than the length of the biscuits to allow for mis-alignment. The kits comprise a groover, arbor, spacers and three bearings to suit biscuit sizes #00, #10 and #20. Shank sizes of 1/4", 3/8", 1/2" or 8mm are available. Sets should be ordered using the part numbers listed below. The kit prices show a saving in cost compared with buying the individual components. 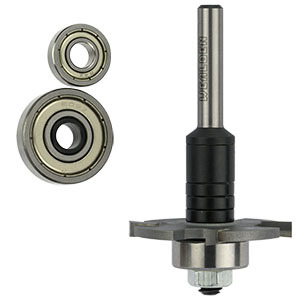 The parts should be assembled onto the arbor using the spacers to make up the length; the bearing can be fitted either above or below the groover. It is important to check that the groover is mounted the correct way round: fitting the groover upside down will stop it cutting and result in clouds of smoke!